We are The D. We are The D. We are The D. We are The D. … er wait they’re VW Trainwreck. They are also a three piece punk-n-roll band from Tempe, AZ. Don’t get me wrong by the D reference. 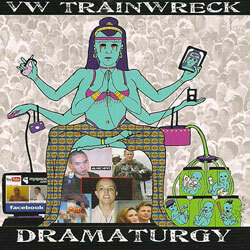 I enjoy the D and VW Trainwreck offers some of that same appeal (albeit without the dead on comedy approach except maybe on #5 VW ThemeWreck ) Dramaturgy kicks out 16 heavy tracks. Some of these tracks are over 4 minutes. Unless you are making a Rock Opera, this is unacceptable. All tracks over four minutes will only be listened to for 2:15 (I get to pick which parts) … ah yes, that is much better. If you wanna know what the band is all about, here is a bit from the one sheet, “The album revolves heavily around”. Sure that is way out of context, but I think it sums up Dramaturgy nicely. It is mostly heavy. It revolves around. On a more real note this disc is decent but runs a little too far into the rock vein for my personal preference. I would like to check out a live show though as it does appear that they know how to rock.